Like all great mysteries this one stares out of a blurred photograph. But this is no picture of the Loch Ness Monster, Sasquatch or even Elvis, this is a photo of a small finch sized bird. It is a pretty bird with a black face and golden collar, and I snapped it while it sat on the wall of our garden, in Kensington, Johannesburg. It had been hanging around for a couple of days, but this time I was able to grab a camera and get off a couple of shots. Why I took those photographs was because I had no idea what this bird is. I had paged through a couple of South African bird books but nothing. Finally I fired off an email to Dr Craig Symes, an ornithologist at Wits University with the photograph. Initially I had held off contacting Craig as I was sure the bird was some common garden variety, easily identifiable. Perhaps it would be embarrassing and I would be wasting Craig’s time. Surprisingly he replied telling me he had no idea what it was. He forwarded my email on to a couple of other bird experts and like him they were flummoxed. One of the suggestions was that it was a Nelicourvi Weaver from Madagascar, this bird had the right colour combinations but it is the wrong body shape. This is what it looks like: it is about the size of a finch, it has a black face and a yellow collar. The rest of its body is an olive green. Craig suspects that it is an aviary bird that has escaped from somewhere. This is becoming quite common, he explained. I haven’t seen the bird for a while, but if anyone out there can identify it, drop me an email. 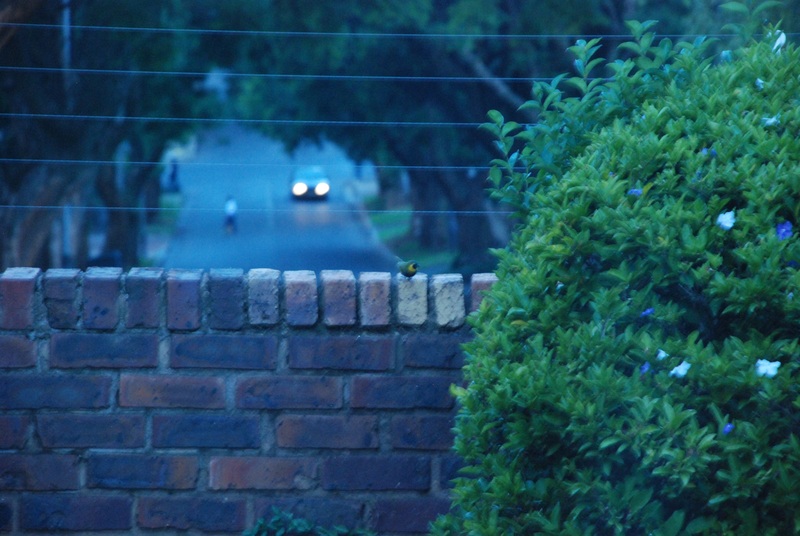 This entry was posted in johannesburg, Kensington, Uncategorized and tagged aviary bird, birdwatching, unidentified bird. Bookmark the permalink. 1 Response to So what is this strange bird?